SP Setia and Ivory Properties Group have responded to Penang state government's tender to develop the Bayan Mutiara land. George Town: Two property players are in the race for the multi-billion ringgit development of some 40.47ha at Bayan Mutiara on Penang island. 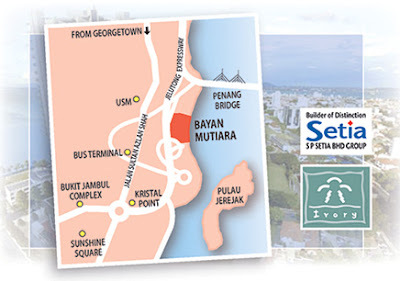 Business Times has learnt that SP Setia Bhd and Ivory Properties Group Bhd are the companies that have responded to Penang state government's tender to develop the Bayan Mutiara land. The tender is part of the state government's efforts to raise funds. Sources said of the two companies, Ivory Properties had submitted the higher bid, for which the reserve price was reportedly set at RM200 per sq foot. The state government had asked for a request for proposal (RFP) via the Penang Development Corp to develop an initial 24.8ha, which is located south of the Penang Bridge and overlooking Pulau Jerejak. The RFP comes with the potential to develop an additional 14ha via a future reclamation after the development of the initial 24.8 ha. Although the deadline for the RFP of the project was set for December 31 2010, it is learnt that the RFP had been recalled and interested parties were asked to re-submit their bids. SP Setia is currently the only developer without any development projects along Penang's southern corridor where its rivals are present. This includes Mah Sing Group Bhd, which is planning a mixed-development property project at Batu Maung. Ivory Properties is present via "The View Twin Towers" development in Batu Uban, while IJM Land Bhd had already embarked on its landmark waterfront development of "The Light" close to the Penang Bridge. The project was reportedly meant to create a "Penang People's Park" that includes the country's first subterranean Penang International Convention and Exhibition Centre (sPICE), a 2.8ha public park on the rooftop, a refurbished and upgraded Penang International Sports Arena (Pisa), a refurbished and upgraded aquatic centre and a four-star hotel with retail outlets and a spacious parking lot. It is not known if SP Setia and the state authorities have inked any agreement to firm up this deal. In a filing to Bursa Malaysia today, UOA said it proposed to develop the 1.94-hectare land into high-rise residential and the development was expected to commence in the fourth quarter of 2011. "The land is strategically located approximately 15 km from Kuala Lumpur City Centre, within the mature suburbs of Sri Petaling, which is a densely-populated and highly-accessible residential area," it said. In a separate statement, the group said its wholly-owned unit, Paramount Properties Sdn Bhd, has won the 2011 Green Building Index Provisional Gold Rating award. The award was awarded for its four office towers located at The Horizon, Phase 2, it said. Its chief operating officer, David Khor, said the award marked the beginning of the group's venture into Malaysia's green economy, particularly through its flagship development, Bangsar South City. KUALA LUMPUR: GROMUTUAL BHD has acquired two pieces of freehold land in Johor Bahru for RM44 million as part of its plans to replenish its land bank in strategic locations for future development. In a filing on Tuesday, June 7, Gromutual said its wholly owned subsidiary Rainbow Entity Sdn Bhd had acquired the two lands measuring 9,079.88 sq meters and 5.37ha respectively from Ladang SPK Sdn Bhd. It said the purchase would be financed via internally generated funds and bank borrowings. “The development on the said land is expected to contribute to the medium to long term future earnings of the Gromutual group,” it said.